As I have mentioned before (blog, 26 Aug 2008 and 25 Jan 2010), the Guardian newspaper is now able to print accented (= diacritic-bearing) Latin letters not only for west European languages but also for those from eastern Europe. My picture shows part of a page from the 15 April edition of the paper. 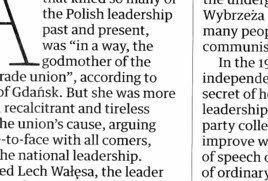 In the course of an obituary for Anna Walentynowicz, “godmother of the Solidarity trade union” they managed Gdańsk and Wybrzeża correctly (though they didn’t attempt Solidarność). But look what happened to Wałęsa! The barred l was fine, but the ogonek under ę turned into a cedilla instead, giving ȩ.
Stranger still, at U+1E1D (Latin Extended Additional) Unicode also recognizes LATIN SMALL LETTER E WITH CEDILLA AND BREVE, i.e. ḝ. You can check it out on the on-line Unicode site here. The on-line version of the obituary has ę correctly. Perhaps these don’t count as “easy access”. Or perhaps people just don’t know about them. If anything, we have a confusingly large range of possibilities. The corresponding methods for inputting æ are Alt+0230, Alt+145, Ctrl+(Shift+)& a, &#230;, &#xE6;, &aelig;. Or ctrl-c, ctrl-v once the character has already been used by others. Alt+four digits is hardly intuitive. AllChars works well for Windows (except Vista and 7) as a Unix/Mac style compose key. Multiple answers on Google, with "e cedilla" OR "e cedille". It seems, it abbreviates (medieval) Latin -ae, for instance. ȩ, what would we do without it? The Unicode NamesList file says that E WITH CEDILLA is used by Uralicists, which means it's part of the Uralicist (aka Finno-Ugric) Phonetic Alphabet. This file is the repository of such usage information as Unicode has. Unfortunately, I can't find an online explanation of (F)UPA in English. As for the Latin Extended Additional block, it's the result of an old compromise. Originally, Unicode and ISO 10646 were to be separate standards. After a lot of work, Unicode 1.0 and the Draft International Standard (DIS) were merged to produce Unicode 1.1, which was also the initial version of ISO 10146 and included all the characters present in either standard. This block contains the Latin letters that the DIS (which was at that stage basically a list of names without explanations) contained but Unicode 1.0 did not, and for which the provenance is basically unknown. In a few cases, NamesList has explanations added after the fact, but 1E1D is not one of those cases. Ö on a Mac has always been option-u, O.
I'm a Pole and today's entry prompted me to do some basic research (that is, Wikipedia) on the ogonek (which, as English wiki aptly informs us, means "a little tail"). Interestingly, Polish wiki says that the letter ę was used also in Latin spelling from the 12th century onwards. In Polish, the letter ę corresponds to the nasal vowel /ɛ̃/. Would anybody be so kind as to answer whether this was also the case in Medieval Latin? John Cowan: thanks for this useful info. AJD: we're not talking about Ö but about ö. The way I've heard it, the Latin 'ae' that turned into a monophthong and later merged with 'e' was written with the 'e caudata', which looks like ę, in Mediaeval Latin. In fact, the standard explanation seems to be that Polish ogonek came from the 'e caudata'. I hadn't heard about the 'e cedilla' being used for this purpose. One other thing: Unicode doesn't encode all letter-accent combinations. The theory is that all such combinations can be encoded with the base letter (like U+0065 'latin small letter e') and the combining accent (like U+0328 'combining ogonek'). In practice, of course, most such combinations are encoded in Unicode as a single character (like U+0119 'latin small letter e with ogonek'), because of compatibility issues with existing code standards which generally encoded accented letters as single characters. The vast majority of Unicode-compliant text encodes accented letters as single characters where available. Therefore, if an accented Latin letter is encoded in Unicode, it means that there is some language or transcription system out there that uses it, but the converse is not true. There are accented letters in use in some orthographies which can only be encoded as the base letter plus combining diacritic in Unicode and not as a single character, because they were obscure enough not to be included in pre-Unicode code standards. Thank you for the instructions on how to type ö. I wasn't aware that one could do this. Yes, and ö on a Mac has always been option-u, o. My previous example was merely at the beginning of a sentence. And the umlaut has always been Alt+u, V on my PCs too. I was used to Macs from the time they were invented, and it was grievous to have to accept in due course that transferring to the death-dealing PC was inevitable. Ctrl+(Shift+):, V was the least of my annoyances, but I immediately set up the key combination Alt+u, V to mimic the Mac. In fact I considered most of the key combs native to Word to be rubbish. It's always worth setting up your own less fussy or more intuitive ones (until you have to use someone else's computer). I'm sure most posters of this blog will know this, but for those who don't, the International Keyboard Layout ( http://support.microsoft.com/kb/306560 ) is a god-send for those who type in more than one language and don't want to Alt-Shift multiple times every time they begin to type. You just have to remember that to type one of the special characters ' " ^ ` ~ you have to press Space Bar afterwards. I'm using Linux. My default keyboard layout has ö as AltGr+[, followed by a lower-case "o". This makes äëïöüẅÿ trivially easy. Better still, AltGr+;'# followed by vowels offers acute, circumflex, and grave accents respectively. And a cedilla is on AltGr+=. There are other accents on other keys (for instance AltGr+@ gives a haček), but I don't tend to use them much. Unfortunately not. In earlier versions of Unicode, Turkish s-cedilla and Romanian s-comma and t-comma were unified as s-cedilla and t-cedilla (a state of affairs inherited from ISO 8859-2). When this overunification was undone by adding proper s-comma and t-comma characters, t-cedilla became useless, as no language or transcription system uses such a thing. WP says that it was once proposed for use in learned French words ending in -tion, -tial where orthographic t is pronounced /s/, but never adopted. What is this all about? Is this file the repository of such usage information as Unicode has! Doh! Found my own solution. After some more poking around, I was pointed to a font issue -- Arial Unicode MS seems to have the proper glyphs for 'combining ogonek', among others, allowing me to use i + acute + combining ogonek to get around the tittle problem. Hope this helps someone else. The note in Unicode NamesList.txt file about Uralicist usage seems to apply to the letter "A WITH DOT ABOVE", not to "E WITH CEDILLA". The letter ȩ is also used in the Latvian phonetic alphabet, an extended version of standard Latvian alphabet used by local linguists. There it can take some other accents to indicate syllable tone: ȩ̃, ȩ̂, ȩ̀. In Unicode, ȩ is followed by some letters for Livonian, a near-extinct Finno-Ugric language spoken in Latvia. I don't know whether this sequence is accidental or not. The letter ḝ is a mystery to me. ḝ was used in ISO 259 for transliteration of Hebrew U+05B1 (hataf segol). See https://en.wikipedia.org/wiki/ISO_259 and https://www.unicode.org/mail-arch/unicode-ml/y2012-m05/0123.html .